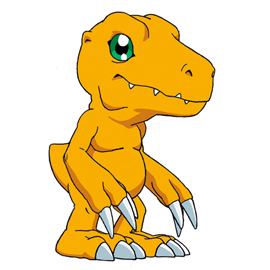 Agumon is the Partner Digimon of Yagami Taichi in Digimon Adventure, Digimon Adventure 02 and Digimon Adventure tri..
Agumon has a generally happy personality. As Taichi is the assumed leader of the gang, Agumon acts sometimes as the leader of the Digimon when the Chosen Children are not around. War Greymon and Omegamon appear in the Super Digica Taisen card game.